Patriotic jewelry may have never been on your radar before. But perhaps you’re a proud resident of your state, and you want a fun, subtle symbol to reflect that. Or maybe you’re a curious collector, looking to start a new project? Consult our useful guide to learning more about your official state gemstone, mineral, and more! In the second part of the Patriotic Gemstones series covers Hawaii, Idaho, Illinois, Indiana, Iowa, Kansas, Kentucky, Louisiana, Maine, and Maryland. Don’t see your state? Check out this page to read the rest of the Patriotic Gemstones series. Officially known as “The Aloha State“, Hawaii is a fair state for those interested in collecting rocks and mineral specimens. The natural terrain considerably limits such prospects. Surprisingly, Hawaii has two documented meteorites, and it is a goldmine for rock hounds fascinated by volcanoes. Lava flow and coral on Oahu’s north shore. Black coral is present in the offshore areas of Hawaii; the region also includes pink and gold coral. Oceans across the world contain more than 150 species of black corals, out of which 14 are found in Hawaii. Black corals are carnivorous animals that grow in various shapes such as the spiral coils, fans or as tree-like branches. They feed on animal plankton brought by ocean currents. Despite being a brilliantly colored living tissue, black coral is named after its unique black or brown stiff skeleton. Hawaii is the home of a wide range of minerals, starting from simple compounds such as chalcanthite to the more complex groups such as silicates. Some readily found minerals include sulfates, phosphates, and carbonates. However, the state does not have an official state mineral. Hawaii hasn’t designated any particular rock. In the region, silicate minerals form most rocks. There is no singular chemical structure to them, as they are formed from a combination of minerals. Some of the regular minerals found in these rocks are quartz, mica, and feldspar. Popularly known as “The Gem State,” Idaho is an amazing rockhounding state! Soon after the discovery of gold in the Clearwater River in 1860, miners began developing the Idaho mines. The mountains in the region contain rich deposits of silver and other precious metals, including gold, lead, and zinc. Idaho is also the home of five major meteorites. Star garnet is a unique form of garnet with asterism, or the star effect, which is mostly found in sapphire and ruby. Star garnet is extremely rare and is found only in two places: in the state of Idaho and India. The asterism property is displayed mainly by two garnet varieties, namely almandine, and pyrope garnet. The star effect in the garnets is the result of rutile inclusion and most of the star garnets found in Idaho display a 4-ray star and 6-ray stars effect. • Popular in Idaho, Bruneau jasper is a red and green gem-quality stone. The reason behind the lovely shades of this stone is the presence of silica. Bruneau jasper deposits are located approximately 50 miles south of Bruneau in Owyhee County. • Located about five miles east-northeast of the town of Spencer, the Spencer opal deposits in Idaho are popular across the globe. The well-known Deer Hunt Mine is one of the best deposits, discovered in 1948 by two deer hunters lost in a storm. • Corundum is made of aluminum oxide, and its hardness is second only to diamond on the Mohs scale. Gem quality corundum is found at placer deposits rather than in the rocks where it originally forms. Placer deposits are shifts of material through the normal effects of gravity. Deposits of corundum are located at Stanley Basin in Custer County, headwaters of Goose Creek and Gold Fork tributary of the Payette River. Idaho does not have a state rock but has a diverse range of rocks found in their state. For example, you can find marble, dacite, gneiss and conglomerate as a few of the most common rocks. Also known as “Land of Lincoln” and “The Prairie State,” Illinois is popular for the Mazon Creek fossil sites and fluorite deposits. Amazingly, Illinois is the home of at least nine meteorites, including the Benld Meteorite, that, in 1938, hit a garage roof and ended up in the car seat. Also, the Field Museum of Natural History is must visit destination for any rock and mineral enthusiast. Since Illinois does not have a lot of gemstones native to the state, Illinois does not have a state gemstone. Being a crystalline form of calcium fluoride, fluorite is crystal clear when pure. However, fluorite can show a variety of shades such as deep purple, sky blue, sea green, or sunny yellow, depending on the impurities present. The major deposits of fluorite in the United States are located at Rosiclare and Cave-in-Rock in southern Illinois. The state has been the largest producer of fluorite in the United States. The mineral is used in manufacturing steel, enamels, hydrofluoric acid, aluminum, and glass. The State of Illinois is rich in rock resources. However, the state has no official state rock. The region features geodes and spherical rock structures in volcanic or sedimentary rock formations. The size of geodes range from less than one inch to more than two feet, and they are sometimes hollow with crystal structures inside. Geodes often vary in color, and they are mainly found in the western region of Illinois within the Warsaw rock formation. Known as “The Hoosier State,” Indiana is fantastic for anyone who loves geology. Famous for limestone and coal deposits, Southern Indiana is home to Salem limestone (named after the city of Salem) which was formed during the Mississippian Period more than 300 million years ago. As the seas and geologic developments left behind limestone, rich green forests left coal. The Empire State Building is one of a few American monuments that is built with Salem Limestone (Indiana’s State Rock). Indiana is not known for any large deposits of gemstones. Though there isn’t a currently recognized state gem, it’s possible to find specimens of quartzes, fluorites, and other crystallized minerals. Indiana is popular for its rich mineral resources of calcite, dolomite, quartz, pyrite, fluorite, and celestite. However, the state does not currently recognize an official mineral. There are more than 4,000 variety of different minerals found in the region, but many are very rare. Around 200 minerals form the majority of rocks. The region also has feldspar in abundance. 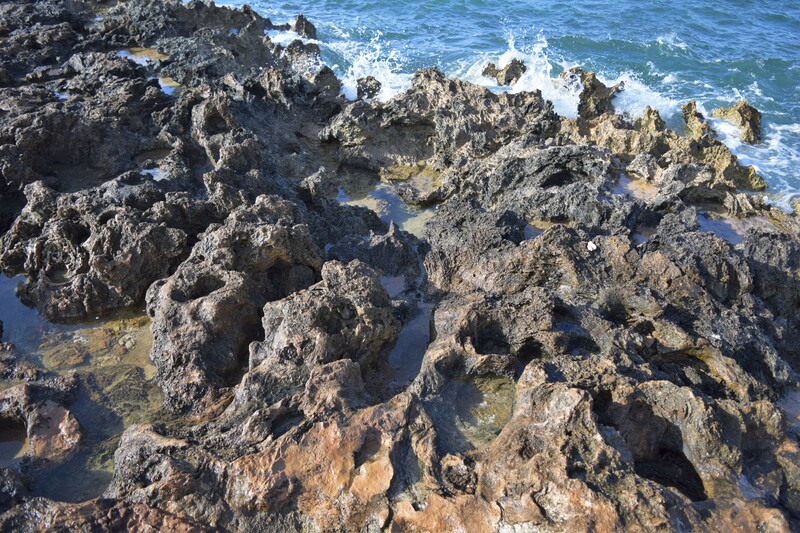 The sedimentary rock is made from calcium, limestone is the fossilized remains of marine animals. Millions of years ago, the area was covered with coral reefs in the area now known as Indiana (located south of the equator). This lead to the formation of limestone in south-central Indiana. Due to the uniform texture and ease of use, Salem limestone is popular for construction and has been used for over one hundred years. Indiana is one of the leading producers of limestone, and Bedford Indiana is popularly known as “Stone City.” Salem limestone is found in both the Empire State Building and the Pentagon. Known as the “Hawkeye State,” Iowa is a great state for rockhounding. The state is known for its sedimentary deposits, as Iowa was under a Cretaceous shallow sea. Accordingly, it also has deep caves and fossils. The state is a haven for exploration as numerous meteorites have been recovered in the region. Iowa doesn’t have an official gem. However, freshwater pearls are easy to find in the slated and freshwater bodies near Iowa. The pearls are round with a glossy surface, and they show an iridescent white, pinkish, or silver tone. Although they are not in abundance, pearls are found in various locations within the state. Iowa is also home to a rare quartz pseudomorph known as moss agate. The presence of natural chalcedony in Iowa creates fertile ground for the occurrence of moss agate. Moss agate is a white stone, with green mossy inclusions. Although there is a large variety of minerals found in Iowa, the state has not announced any official state mineral. Minerals that can be found within the state include limonite, pyrite, marcasite, calcite, and gypsum. The word “geode” is drawn from Latin and means “earthlike,” a reference to their circular form. Iowa geodes are mostly sphere-shaped, and sometimes lumpy or cauliflower-like in exterior formation, with a diameter going from two inches to six inches. Geodes are hard on the outside and are usually found in limestone formations. The most preferred are those with hollow interiors. However, they are hard to find as the crystal growth fills the internal space. Geodes from the Keokuk area encompass various minerals, but the quartz and calcite take the lead. Regions of Southeastern Iowa are the best geode collecting areas. One of the most productive agricultural states, Kansas is known as “The Sunflower State”. Despite possessing a variety of natural resources, Kansas is the only state that has not honored any official gemstone, mineral or rock until 2018. Initially called “kansanite” after the discovery of the Cretaceous age fossil resin, Buddhue renamed the gemstone “jelinite” in honor of George Jelinek – a prominent rock collector and politician. In 2018, a fourth-grader petitioned to officially recognize jelinite amber as the state gemstone after being inspired by reading several rock collector’s books. Galena is the world’s primary mineral of choice to obtain lead. The mineral is really important to Kansas history since one of their towns was named after the mineral. During the 1800s, the mineral was mined predominantly that helped build Kansas’ economy. The bill to pass Galena as Kansas’ State Mineral was petitioned by the same fourth grader who petitioned for jelenite amber to be the state’s gemstone. Limestone was initially chosen by the same fourth grader because he said it was “popular and easily recognizable.” It is found in the Great Plains and is known to preserve fossils that are from the Cretaceous period. Although the fourth grader petitioned for general limestone to be the state’s rock, the Kansas government decided to specify it to be Greenhorn Limestone. Famous for its Mammoth Cave, Kentucky is a state to find great deposits of chert, agates, flint, concretions, galena, fluorite, fossils, and geodes. Also called the “Bluegrass State”, this state is known for its enormous coal deposits. Meteorites have been discovered in 27 different locations in Kentucky. Freshwater pearl are one of the rare gems that are organic in origin, coming from a living creature. The petitioning of schoolchildren led to its adoption as the official gemstone in 1986. This is no surprise as Kentucky is one of the top three producers of coal in the United States. The annual production of 150 to 160 million tons coal makes it possible to acquire the position. There are two fields which produce the majority of coal: the Eastern Kentucky Coal Field and the Western Kentucky Coal Field. Kentucky coal is burned to generate electricity at power plants to generate electricity. Known for their unique swirl of colors beneath the gray outer layer, the Kentucky Agates is from the Early Mississippian age. The colors are from the impurities found within the rock itself. What is ironic is that the Kentucky Agate is actually a mineral, but Kentucky officially recognized the mineral as the state rock before consulting with geologists. Well known for its oil, gas and salt domes, Louisiana is a state that offers great opportunities for collecting. Also known as the “Pelican State,” it is a state with substantially diverse habitat, and you can find a variety of fossils along with abundant sources of agate, petrified wood and chert. Oyster shell replaced agate in 2011. This organic gem is grown from the oyster known as Crassostrea virginica. The cut and finished shell products are considered to be a gem. The Louisiana coast is home to an abundant supply of mollusks that makes it easy to create oyster shell gemstones. From 1976 to 2011, Louisiana’s official gemstone was the agate. After acting as the former official Louisiana state gem from 1976 to 2011, agate became the official state mineral in 2011. Agate is easily discoverable in Louisiana gravels. This mineral is readily throughout the state. Originally from the Oligocene era (or 30 million years ago), the palm tree died and was buried by groundwater that preserved the wood. The petrified palmwood is known for its black polka dots pattern that swirls around the petrified palm wood. It is believed to help increase the wearer’s “practicality powers” and provides peace to the wearer. Also known as “The Pine Tree State” and “Vacationland,” Maine has earned a reputed place among rockhounds for its rich sources of minerals. If you love exploring for beautiful gemstones and rocks, Maine is the place. Famous for its tourmaline, Maine has also documented five meteorite impacts. Maine has not designated any official state gemstone. However, this state is filled with rich sources of beautiful gem specimens. With so many mineral resources, there is an abundance of stone varieties found here. Aquamarine, beryl, topaz, morganite, smoky quartz, and amethyst are some of the more common finds. In fact, the state mineral has a gemstone version found in its natural state. If you’re a gemstone collector, it is a great place to rockhound and boost your collection. Tourmaline covers a variety of minerals that possess similar crystal structure but can be differentiated regarding composition and color. There are two varieties of tourmaline group, which are prominently found in the igneous rocks of Southwestern Maine. An iron bearing tourmaline, black in color known as ‘schorl’ is the most common tourmaline find of Maine. Another variety named as ‘elbaite’ possesses a variety of beautiful colors. This colorful tourmaline that illuminates its beauty in pink, blue, or green crystals, or some combination of these three. This state even offers a ‘watermelon’ variety of tourmaline which filled with pink and green color. Some of the tourmaline specimens of Maine can rival the best pieces from Brazil, California and the Himalayas! While Maine a great selection of gemstones and minerals, this state also has some good rock finds. Most of the best minerals discovered in Maine are located in an igneous rock also known as pegmatite. It is extremely rough-grained stone. Interestingly some rare minerals such as topaz, beryl, and colored tourmaline are developed within pegmatites. Occasionally nicknamed as the “Old Line State”, the “Free State”, and the “Chesapeake Bay State”, Maryland is the known as the birthplace of religious freedom in America. Famous for its fossil deposits, Maryland has earned popularity for its Miocene shark teeth. For a rockhound, it’s a good place to discover some unusual specimens. Patuxent River Stone is an agate. Displaying yellow and red colors, the material reflects the colors of the state’s flag. It has been the state’s official gemstone since 2004. Maryland does not boast a wide a variety of minerals. Still, you can discover gold here, along with sphalerite, pyrite, and galena. The copper districts of Maryland offer gold that is considered as the minor mineral accessory. Interestingly, there are associated maps that indicate old gold mines, forecast and testified gold existences in the Maryland. The Chesapeake Bay State doesn’t have an officially declared rock. Limestone is available in some abundance, and since the state’s earliest days, it has been used as a building and construction material. Most commonly, it is ground for use in cement. A high-grade white variety is also used in glass production. Next post What is the Difference between Zircon and Cubic Zirconia?